I purchased this based on reviews. I'm running an FX-8320 e 4GHz on it and a single r9 280X. It works well enough but I wish I had purchased something a bit more expensive (like an Asus). Since I am running an MSI video card I decided to go with the MSI board as well since they have some tools that take advantage of having a matching setup. I haven't really benefitted from it though.The good:-plenty of usb ports-onboard audio works well-ok manual overclocking controlThe bad:-I hate the GUI bios. Mouse driven doesn't make any sense to me since I usually want to get in quick and change something. You can do most (all?) this with just a keyboard, but it isn't as efficient as keyboard biased BIOSes-Firmware updates are easy, but remove your settings. My sata mode got changed and my OS wouldn't boot. Took waaay to long to figure it out and had to find it on a random forum.-The in bios fan control is very limited and MSI's provided software requires admin access on launch (should really be a service with a low privilege gui). Minor nitpick for some, but being able to set a temperature target for my system fans seems like a pretty basic feature. Yes you can set the processor fan to a temp target, but not the system fans (just a static speed). Yes, lots of solutions to this "issue", but bios settings is the clean simple way that is OS agnostic.-The board has all the inputs/outputs I'd want except it doesn't have a single esata. I have laptops and all-in-ones with esata. USB3 somewhat makes up for it, but I wish I had noticed there is no esata before purchasing. -My ram didn't auto clock correctly at 800/1600. Easy enough to fix if you know your ram timings, but that's going to catch some people up. Might have just been the Corsair Vengeance Blue I bought. I've never had this happen with a motherboard before (and I've been building my own computers since the 90s).Conclusion:For a budget build this is fine. It is stable and I'm getting good performance out of it. In hindsight I wish I spent more, but I'll be sticking with this unless I have any stability issue (which I doubt I will as it has run fine for months now). Many reviews complain about the two sata ports being unusable when the second video card is installed. Not true, you simply have to use the "angled" ends of the sata cables and let the cables run under the graphic card to your sata drives so they are usable.You will lose one of the PCI-E1 sockets when the second graphic card is installed.I'm using an AMD FX-6350 CPU with G.Skill 2133 mhz memory and you do have to go into the bios as this board comes with the bios set at default values which allow for memory up to 1866 mhz. Anyone considering buying this board should update the bios and drivers and you will have to install the software on the disk that comes with this motherboard. Live downloads and update s require connection to MSI website. I'd give this 3 stars due to no 20 pin USB 3.0 on board extension and other board limitationsKnowing the price differences, I'd recommend a better board. Cons: My cpu heatsink didnt install very well, details below. My cpu heatsink brackets were too short, or the cpu brackets on mobo were too short, one of the two. Since Im not sure which component is the problematic one, Im giving this a 4 out of 5, but the product is just fine. You just may have to loosen off the cpu brackets for the heatsink a little bit so as to raise the brackets. The installation still went just fine but is somewhat suboptimal because of the bracket issue.Used an AMD 8350 processor in it and Geforce 560 se, works fine.All of my parts work just fine with this, and the BIOS is very simple and easy. I like it, was a big upgrade from my old mobo and I think it was worth it. Not a bad board for the price, though I've heard some suggesting things about MSI. Seems okay so far though. Pros: Great Price for features. Quality components. Full Size. Cons: trouble with chipset drivers using Vista. Opens a lot of option when upgrading from an older motherboard.It was cheaper to buy this board and 8gig of ram than to pay to upgrade my older system to 8gigs of DDR2 ram.Doing so opens my upgrade options up to a lot more choices as to which cpu I can install.Chipset drivers were ok using windows 7, but gave me trouble when I had windows Vista installed first. Everything was ok with Vista until I installed the MSI chipset drivers. After I installed the drivers and rebooted, the sata Dvd-rom did not show up.I've purchased 3 of these so far and I will buy it again for anyone wanting an affordable upgrade with lots of room for performance.I recommend this board to win7 owners or newer, but not for vista or older owners. Great budget board, this guy is getting a bit old now though there are a lot of better picks out there. Still if you can get this for 80 or cheaper it's not a bad buy. 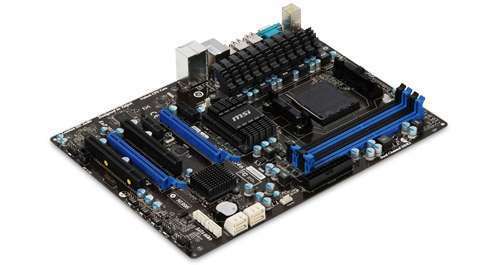 This board is nice for people on a budget, Easy OC with OC genieSupports Crossfire or SLI. i love the BIOS of this mainboard, it's browser and os are fun to have. overclocking genie included for an automatic overclocking and core unlocking. there are bad reviews on the 970a-g45 of this board, but none so far from any owners i have found for the g46. all they have done is added a bigger heatsink apparantly but it seems to have done the trick. all in all, i cant wait to see in the long run but for my value gaming rig, i am more than happy. The board works wonderfully for the price. If you are looking for a board that can support gaming habits, this one doesn't have any problems when paired with the right components. Definitely a good buy. It is an average motherboard. It is as good as you would expect for a $75 atx motherboard. The heatsink gets hot, which is troubling. Cons: Haven't determined if a DIMM slot is the reason for my memory issues at the moment, but will get to the bottom of it. Why haven't you bought this yet ??? Cons: Beware, if you are buying this motherboard for a linux system you might want to check first if there is any incompatibility or module (driver) issue with your distribution and/or kernel. I've got a issue with the network card that wasn't working out of the box. But MSI had a working module to download on their website. So long story short it's working now! Pros: Great motherboard with feature you expect from a performance motherboard! It's great to have 6 sata3 ports. If you have an SSD you will feel the wind, I'm telling you! Bought this motherboard in a bundle for my average gaming PC with a AMD FX-6100. The Bios was already updated for the CPU so that was a good thing. Pros: Very good motherboard, i bought this on sale and very happy with the price of $69 after in-mail-rebate. Works like a charm, OC Genie works perfectly, impressed with the bios settings. this board is ok for starter or budget builds.decent design with 970 chip and am3+ stock, good for upgrade.support sata 3 and usb 3 and cf/sli, under $100, i think it is better than asus and gigabyte's product.new bios interface looks nice for beginners. Cons: No real CONS so far. Pros: Great looks and performance so far. Great value. Pros: Cheap, easy to set up, good all-around motherboard. This is the kind of board that I use in builds quite often, and a good 'starter' board for anyone building a PC. I must say that I've had better luck with Asus boards - but this one shouldn't disappoint. 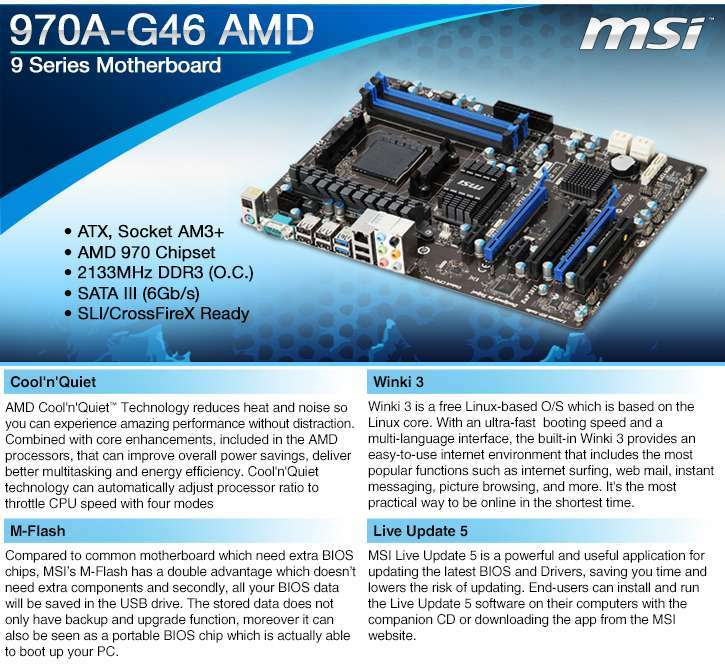 Build a powerful and efficient computer system with the MSI 970A-G46 AMD 9 Series Motherboard. The main PCB offers a set of flexible interface, providing a smooth, interactive communication with several compatible system components. It can utilize the computing performance of any AMD Phenom II or AMD AM3+ FX processors under a 4.8GT/s HyperTransport interconnection, with support from a DDR3 Memory, to facilitate programs and applications. With two PCI Express x16 slots, you can optimize your computer's data SATA III storage with RAID 0, 1, 10, and 5 configurations and GPU video output in an SLI or AMD multiple GPU setup. 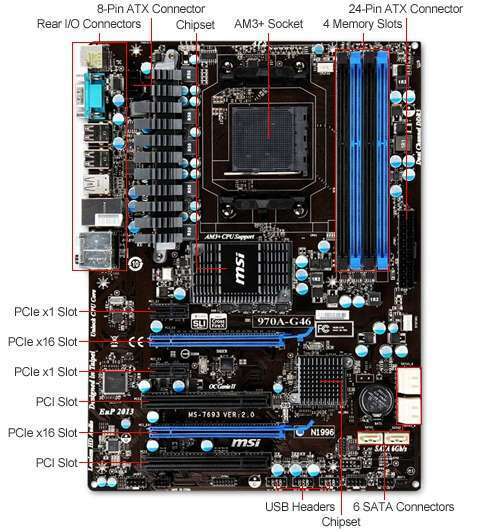 The MSI 970A-G46 AMD 9 Series Motherboard also offers connections for 1000Mbps wired Internet network and two super-speed USB 3.0. Customize your own PC with the MSI 970A-G46 AMD 9 Series Motherboard to suit your needs.